Think of your favorite food, the most versatile and delicious thing you think you could eat for every meal. Maybe for you, it’s pizza, pasta or sandwiches. For some, that food is tacos. 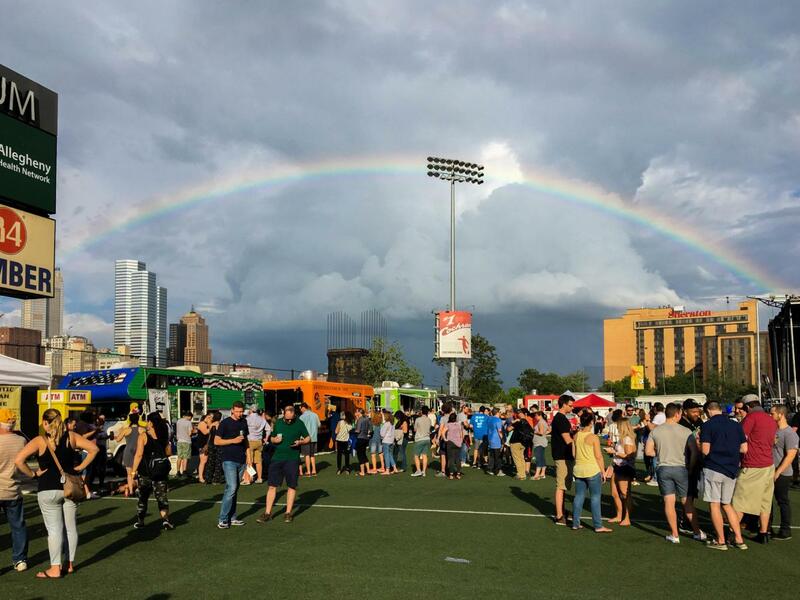 Over the weekend of May 20, a mass of Pittsburgh’s most famous Mexican food descended upon Highmark Stadium near Station Square for the 2nd Pittsburgh Taco Festival. As guests walked past food trucks and drink stands, they took in the festive atmosphere. Tickets for the two sessions sold out quickly — by 2 p.m. there were no more to be spoken for, as both VIP and General Admission were sold out. People were milling around as comfortably as they could in weather that shifted between sunny and rainy — the Saturday afternoon featured temperatures in the upper 80s, and guests responded to this by guzzling water and other beverages until they were sold out. General admission to the festival was $10 in advance or $15 at the door. The price of admission was non-inclusive though, with VIP tickets ringing in at $50 each, giving guests access to an indoor lounge, free parking, a taco buffet and free non-alcoholic drinks. Visitors wandered around Highmark Stadium while Latin music played over the loudspeakers, including a version of Camila Cabello’s “Havana” sung entirely in Spanish. Gavas Beat, a Pittsburgh-based Latin music group, took to a stage in the center of the field — usually reserved for Riverhounds soccer games — to play their set. The smell was unmistakable — not taco seasoning and ground beef simmering in a crockpot, but fresh ingredients mixed in interesting ways. The festival hosted 23 taco vendors and a few popsicle, sauces and spices vendors. Large drink tents lined the center of the soccer field — a popular spot throughout the hot night. There were plenty of food options beyond traditional tacos, including vegan and vegetarian offerings. One vendor, who goes by the name Mr. Bulgogi, served Korean beef tacos. Other hits included Mexican street corn and tacos with different types of fillings, including blackened tilapia and beef tongue. People made the best of the lines as much as they could, often teaming up to hit multiple vendors at once, loading up on sweet treats. Many attendees had young children who ran around the stadium offering big smiles to other people at the festival. Some of the patrons beat both the boredom of the lines and the heat by exploring the large array of beer and icy mixed drinks for sale. The lines for the best food were one of the most difficult parts for attendees of the festival. One of the more popular food trucks was Doce Taqueria — which offered tacos as well as Mexican street corn, or elotes, and taquitos — featured a wait time of about 30 minutes from the end of the line to the truck. Some of the other food trucks seemed to be left with shorter, quicker lines. One vendor to experience both long and short lines throughout the festival was Casa Reyna, a restaurant in the Strip District. Carol Herder, the director of operations, events and catering at Casa Reyna, spoke excitedly about the prospective new customers the festival would bring to her business, saying she was able to inform interested customers about their restaurant. “A lot of people know about our grocery store, but they don’t know that we’re in the corner in the basement,” she said. Casa Reyna’s sister store is Reyna Foods, a Mexican grocery in the Strip District that offers wholesale and retail Mexican groceries and foods. Owner Nic DiCio opened Casa Reyna after Reyna Food’s successes, bringing Mexican flair to Strip District shopping. Herder cheerfully added that the event organizers were very helpful and organized when it came to making sure the vendors were well taken care of. Other businesses took advantage of the opportunity to expand their reach at taco fest including Randita’s Organic Vegan Cafe. According to owner Dale Cinski, the truck normally serves more than just tacos, but they decided to bring just their Mexican best to the festival. He also noted that his truck was the only that offered solely vegan-friendly options, with several others offering vegan and vegetarian options. Cinski said that being at the festival for taco lovers is always a great opportunity to bring new customers to his business.